trip to discover the surroundings and its culture, or who enjoy lounging by the pool immersed in almost unreal peace. Car rental is recommended, have a look at our top car rental offers in Sardinia. Oristano may be Sardinia’s smallest Province, but it boasts some of the most dramatic und untouched scenery on the island. Natural oasis, vast lagoons with flocks of pink flamingos, imposting Roman ruins, magnificient medieval buildings and ancient Romanesque churches await you in this remarkably unexplored corner of Sardinia. At the same time, you are never far from ist enchanting coast, whose highlights include the spectacular cliffs of Sinis and the beaches of Is Arutas, Mari Ermi, Putzu Idu e Maimoni. In a peaceful and secluded setting of lush lawnbs and manicured gardens, Is Benas Country Lodge will appeal to discerning guests who seek a tranquil retreat for relaxation and a base for exploring the unspoilt charms of the area. 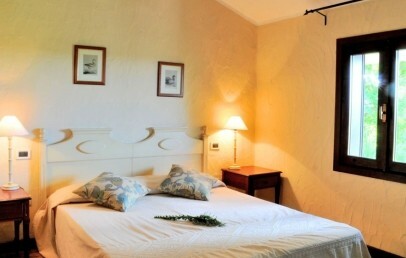 Is Benas Country Lodge, a cozy four star hotel, has a relaxed, informal atmosphere, while its restaurant offers a fine selection of regional and Italian cuisine using fresh local products and a wide selection of wines. 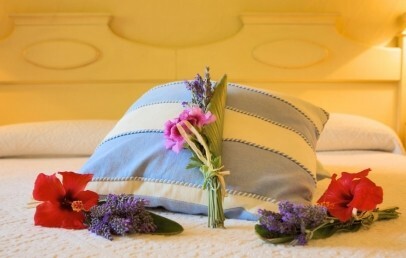 Is Benas Country Lodge offers just eighteen well-appointed bedrooms including two junior suites. All bedrooms have air-conditioning, direct-dial telephone, colour satellite TV, mini-bar, safe and shower room or bathroom with hairdryer. Features include a reception-hall, a cosy bar with fireplace and a lift to the first floor. Set amongst extensive lawns is a fresh-water swimming pool with solarium and sun-loungers. Other facilities include a boules court and bicycles. Nearby is the white sandy beach of Putzu Idu and other beaches are within easy reach by car. The Lodge is located just 20 minutes drive from Oristano and one and half hour from either Cagliari or Alghero airport away. 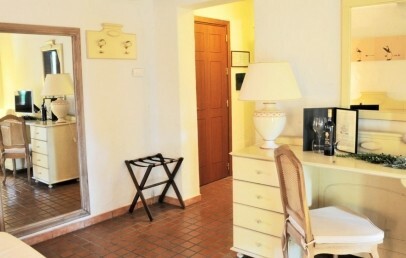 Simple and elegant double room located on the 1st floor. 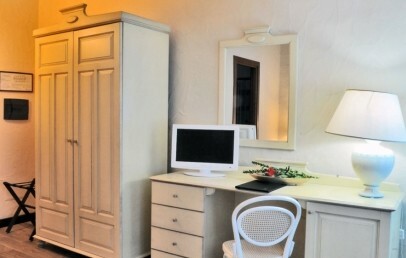 The bathroom is equipped with shower or bath, complimentary toiletries and hairdryer. 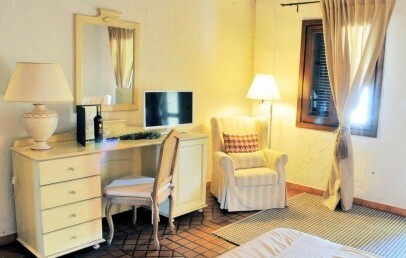 The Classic rooms offer from the window a panoramic country view. 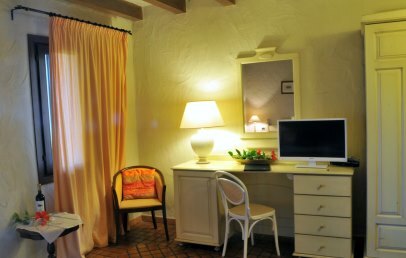 Elegant double room located on the ground floor. 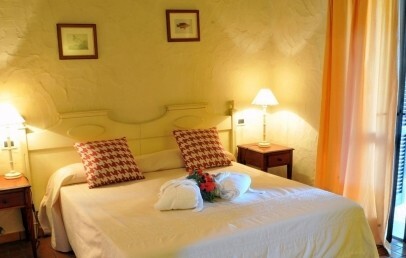 The bathroom is equipped with shower or bath, complimentary toiletries and hairdryer. The Garden rooms have a comfortable and relaxing patio with private garden. Elegant Suite located on the ground floor. 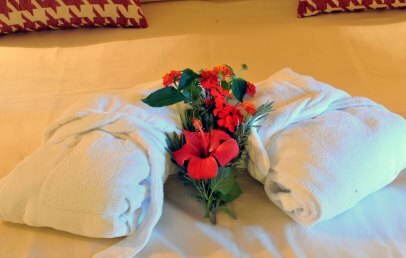 It consists of large double room and living area The bathroom is equipped with shower, Jacuzzi bathtub, complimentary toiletries and hairdryer. The Suites have a comfortable and relaxing patio with private garden.